After countless grey days the sun came out yesterday just in time to go looking for Great Grey Shrike. Annie came with me to Crooksbury Common late yesterday afternoon, where we bumped into Kevin 'Kojak' Guest and Roger 'Dodge' Browne, who were just leaving after a good look round came up with nothing. It was obvious that if these two guys hadn't found the Shrike, I wasn't going to fare any better, so we left and headed off for Cobham. 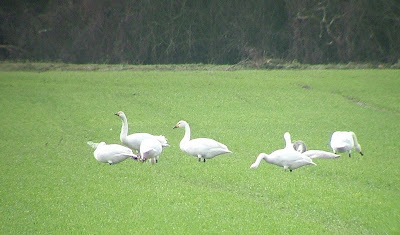 Earlier in the day both Kojak and Johnny Allan had texted me to say that 18 Bewick's Swans had been seen in a flooded field on the outskirts of Cobham. We arrived at about 3.00pm only to find a large number of Mute Swans. There were no Bewick's in sight. It transpired later that they had flown to Walton Reservoir to roost. This morning I decided to try finding a Shrike on Ash Ranges. I left a bit too late, 7.30am, and got caught up in traffic. Two hours later I arrived at Ash Ranges, only to discover that the red flags had been raised. Being a site used frequently by the M.O.D, if the red flags are on view, it means that the site is out of bounds unless you want your head blown off. Not a good start. It didn't get any better at Thursley Common, where I saw nothing of note, and also Compton was a disappointment with the Grey Partridge nowhere to be seen, having been very visible the day before. Thankfully, I received another text to say that the Swans were back at Cobham, and within 25 minutes I was looking at 18 Bewick's Swans feeding in the field they had been seen on 24 hours earlier. Kojak and Dodge turned up again, along with Mark 'Posh' Spicer and Frank Prater, and then later Rich Horton from Tice's Meadow. Seeing Bewick's Swans in Surrey is an unusual but welcome sight to say the least, and made up for the earlier disappointments. Not a bad start to the year, all in all. In less than two weeks I've got two new birds on my list. 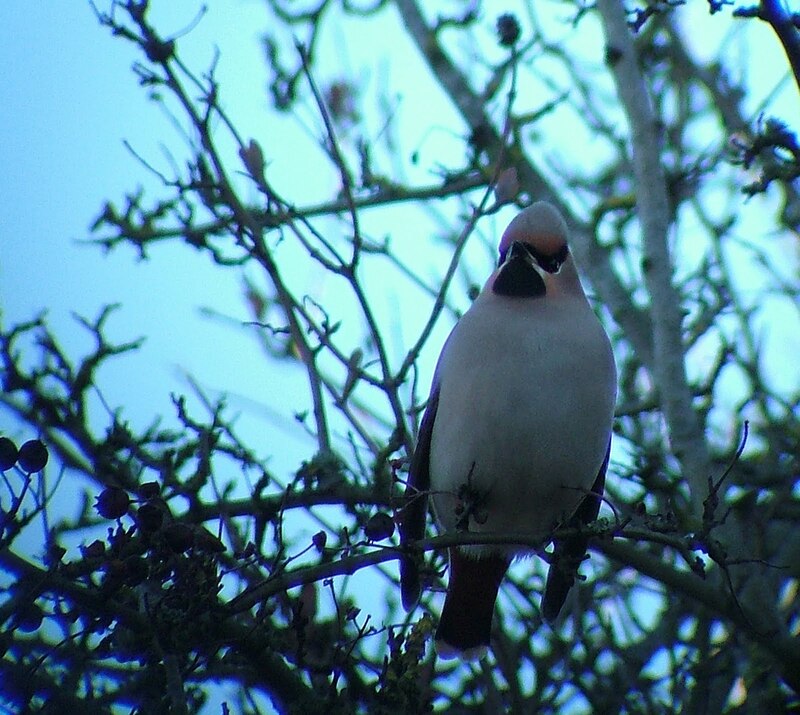 Back home and my trusted flock of Waxwings were still happily feeding on rotting apples on Frenches Road, and now had grown into a flock of between 50-60 birds. Every morning, when I can, I go out to see these birds and I haven't tired of watching them. I don't think I will, either. I'm just lucky that this flock have stayed for so long and so close to home.